We see dynamic, interdependent partnerships and mutually nurturing relationships with Evangelical Church Winning All (ECWA-Togo), and other missions and churches as together we respond to spiritual challenges in modern Togo and beyond, beginning with a focus on the unreached Muslim people groups. To develop leadership and discipleship skills among current and future church leaders. Desarrollar habilidades de liderazgo y discipulado entre los actuales y próximos líderes de iglesias. The largest group of Muslim peoples in Togo are the Met. The majority of the Met live in the central city of Sokodé and in the approximately 60 surrounding villages. Over the years, Met communities have formed in neighbouring Benin and Ghana. Although about 90% of Met are Muslim, many mix Islam with their traditional religion. They are primarily farmers, growing corn, millet, rice, beans, yams, manioc, ground nuts, and okra. They also keep animals such as cows, goats, sheep, and chickens. In urban areas, they tend to be small-scale merchants. The majority of the taxi and truck drivers in Togo are Met. About 1% of the Met have become believers over the past 20 to 30 years, usually through the witness of friends and family. Several foreign and indigenous missions are reaching out in villages and cities, especially in contexts where the Met are away from their families. One organisation is translating the Scriptures into the Met language, with the goal of completing Genesis and the New Testament within two years. SIM began to minister among this people 25 years ago through radio, a ministry that continues today. Today missionaries minister through friendship, disciple-making, children’s ministry and biblical training. An initiative is underway that will assist new Muslim-background believers, both financially and spiritually. Pray for openness to the gospel among the Muslim Kotokoli, Lokpa, Bago, Fulani, and Tchamba peoples. Pray for additional missionaries to serve in Togo, both indigenous and foreign. Pray specifically for missionaries to be sent by the SIM West African Office. 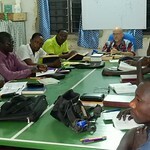 Pray for maturity in the ECWA-Togo churches in disciple-making, leadership training, church planting, and missions outreach. Pray for Christians throughout the country to develop a love and burden for their Muslim neighbours. Pray for training of the pastors with whom SIM works, that God will guide the planning of biblical, spiritual, and practical training.